Nothing But Freebies: Ever been to Paris? I was "playing around" this morning and ended up with a beautiful cluster frame that I want you to have - it's useful even if you have never set foot in the French capital. All you need to do is add your own background and a picture in the frame and - voilà - you've got a finish page. 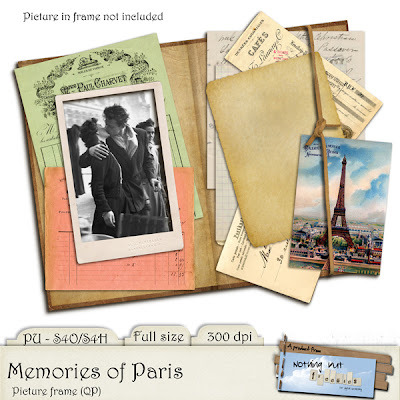 Very Paris, very vintage and very romantic! Click image for direct download (4shared). NEW ZIP UPLOADED - Please try again! i love this, but something is wrong. when i open it it gradually, piece by piece, goes away. can you check it out? thank you. The problem should be fixed now so try downloading again. Thank you so much for this post. I want to let you know that I posted a link to your blog in CBH Digital Scrapbooking Freebies, under the Page 4 post on Apr. 18, 2012. Thanks again. Thank you. I have some precious old photos of my parents in Paris and this is great! The presentation you created is just staggering ! This photo "Le baiser de l'Hôtel de Ville" (The kiss by the Town Hall) by Robert Doisneau is very famous. Have made a layout with it and can send it you for the gallery. However, I don't use outlook and so when I click on your email link I cannot see your email address. Thanks for all your sharing. V.
I would LOVE to see - and post - your layout. Thank you for letting me know about the no-Outlook problem, I didn't know that. I have now added the address beneath the link under "Contact me". Tak også for den. Jeg elsker sådanne ting!! så nemme at bruge til alt muligt.